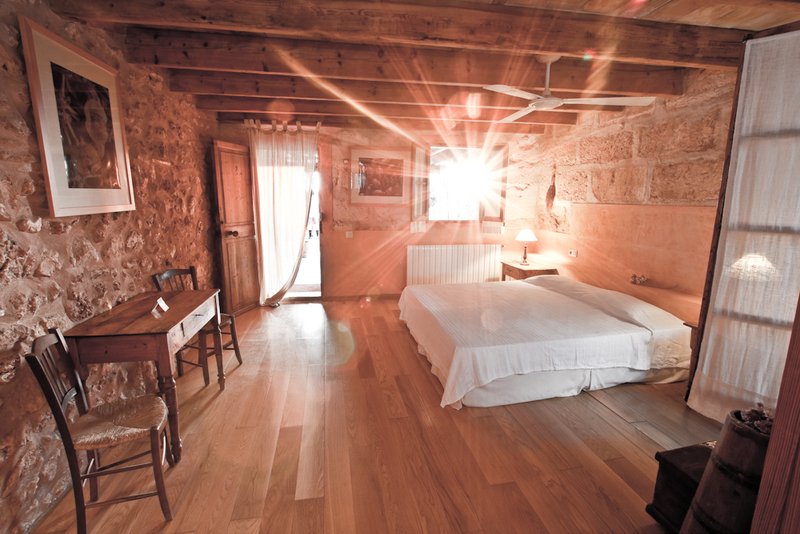 At Sant Blai you will be surprised with our 6 beautiful rooms. 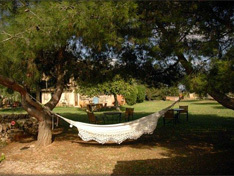 With the name of the Earth elements, we offer you 3 double en suite rooms and 3 very large self – contained cottages (the double rooms are more or less 40 m2 and the cottages about 100 m2).All our rooms and cottages have a private and furnished external area. 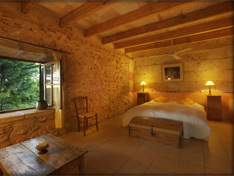 Each room is listed individually below. 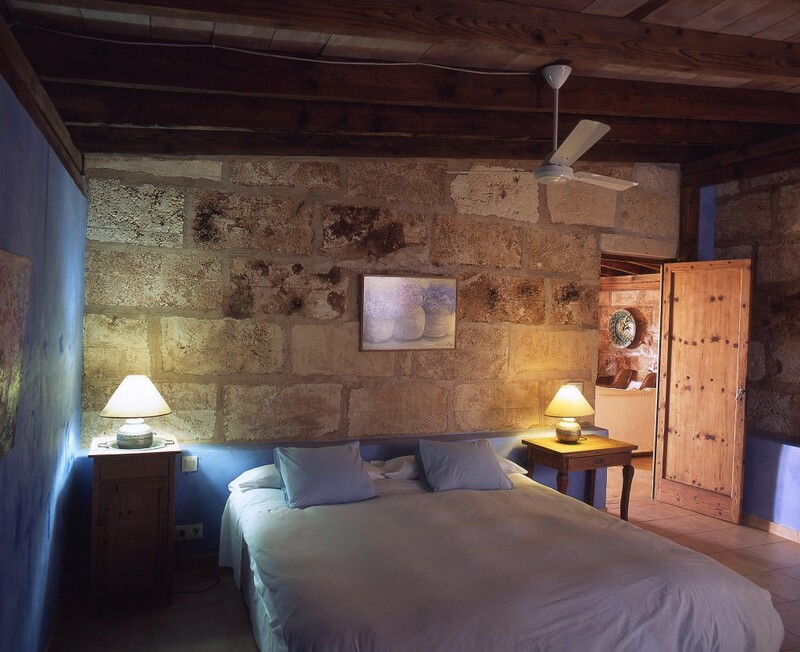 All the bedrooms are decorated in a rustic style to complement the natural stone and wood complete with all the necessary commodities. 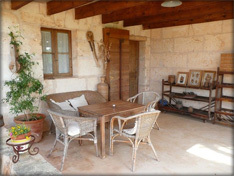 All rooms are independant with direct access to the garden on ground level without stairs. 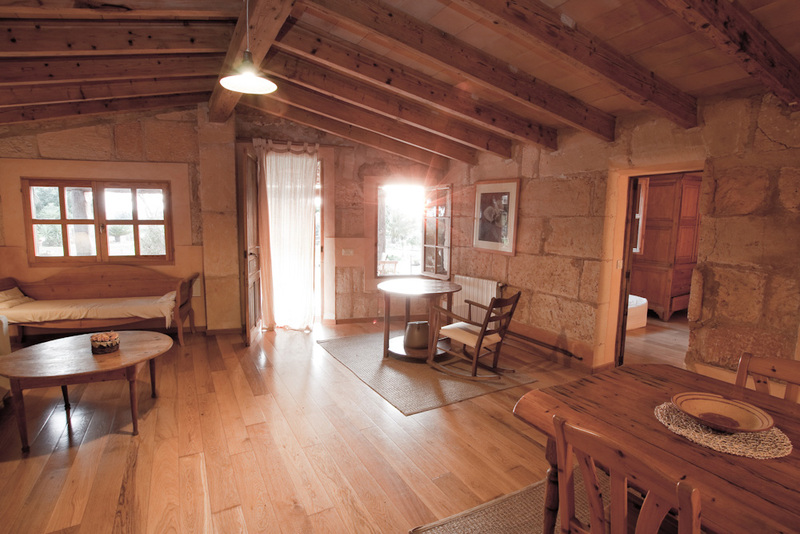 For families with children we prefer to offer the cottages , as their size give the possibility to set up supplementary beds and also because with the kitchen it is more comfortable for the parents to be able to organise the meals for the little ones, in the same room.The double rooms also have a good size, also suitable for families with one child, but it is important to bear in mind that in the double rooms it’s not possible to set up two independent spaces, so parents and child will be sharing one bedroom, as in the cottages, parents can be in the bedroom, children in the living room. 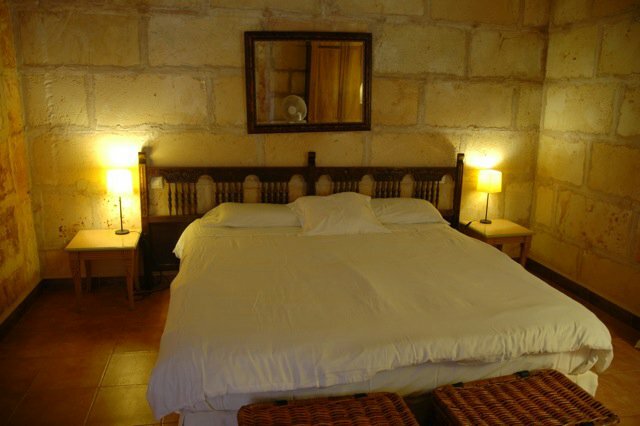 The cleaning in the rooms is every 3 days of your stay. The bed clothes are replaced once a week. 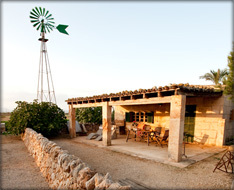 However everyday Cati, will check the rooms to provide what you may need. 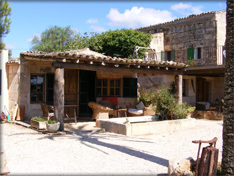 Please help us to maintain the rooms and the communal areas as you find them when you arrive. 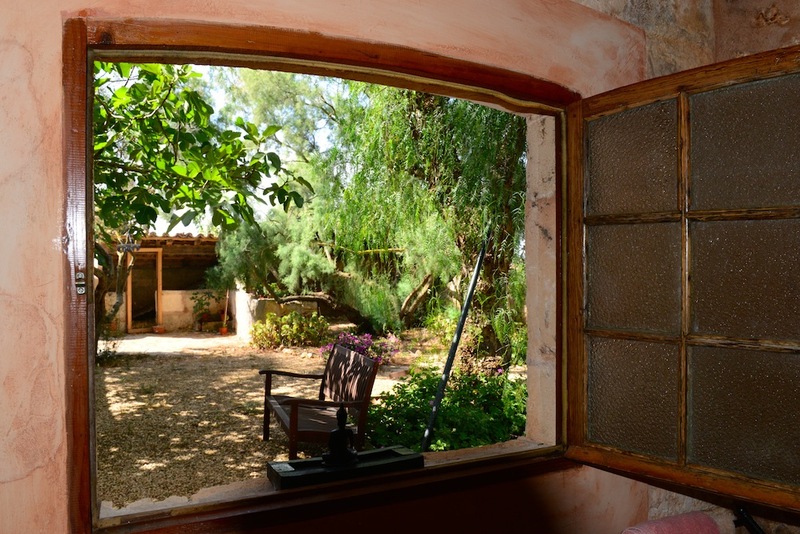 "Agua" takes its name from the old fish pond full of gold fish and frogs that lies alongside the porch. It has a fountain trickling water through an antique water pump, combining the patter of the water drops to the chorus of the frogs.. A wonderful melody! Bamboo and water lilies help create an eco-system that will give you hours of pleasure watching the pond life interacting. 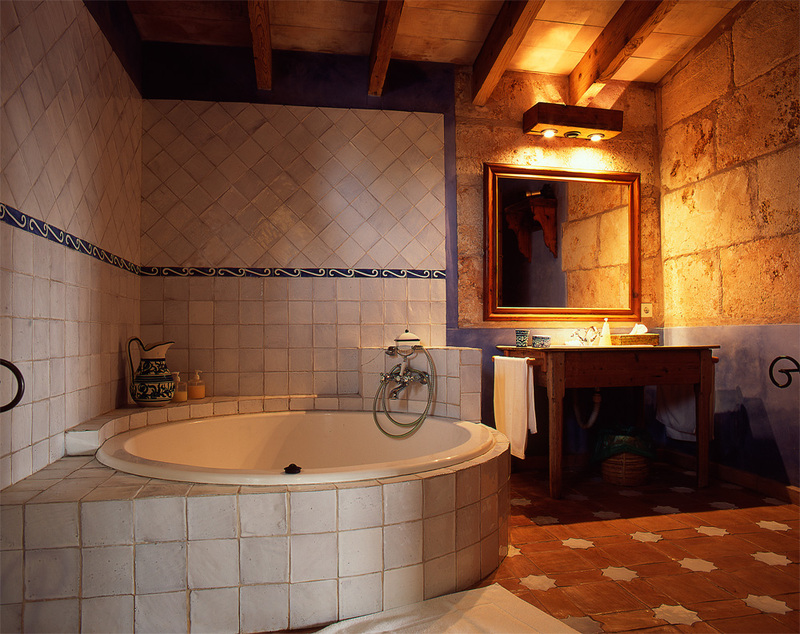 Still retaining the rustic charm of exposed beams and stone walls, Agua also has parquet flooring and an enormous round bath. 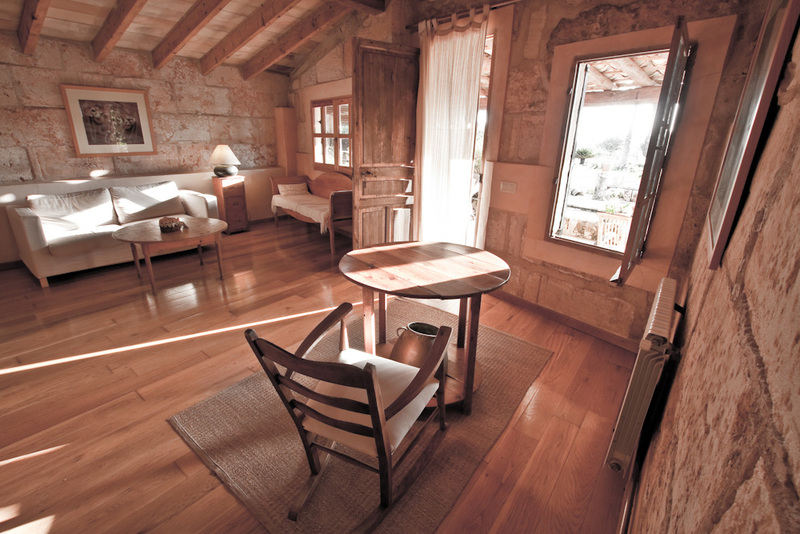 The interior is spacious and comfortable, and, as "Aire" can accommodate four persons (two in the bedroom and two in the lounge). 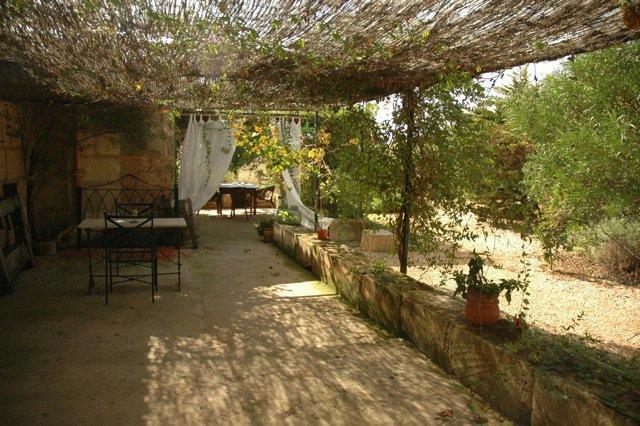 Slightly smaller than "Aire", but still has 90m2 as well as a private porch. 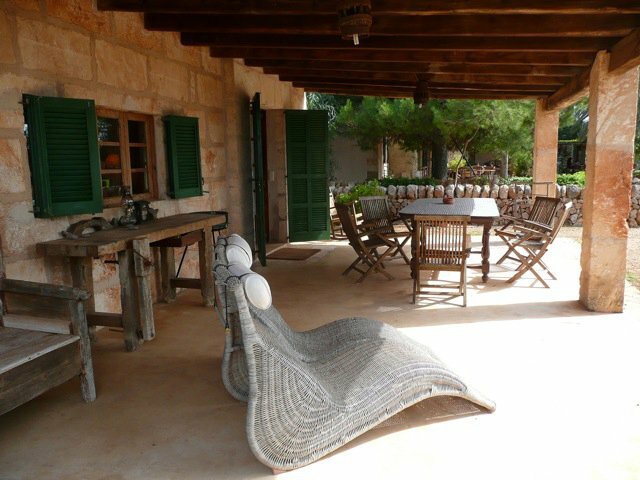 Its terrace is directly in front of the main garden and also enjoys the views of the beautiful sunsets.Agua is very cosy and comfortable. 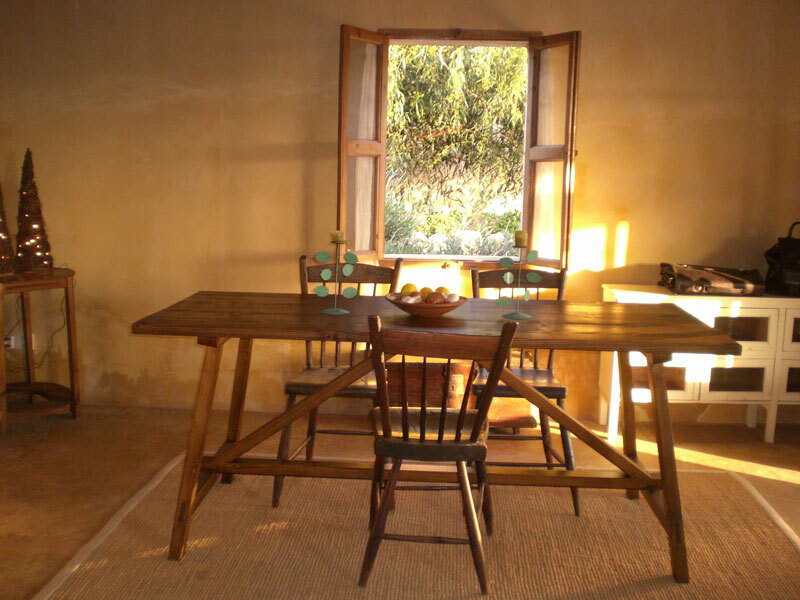 Aire is decorated with tasteful rustic finishes and has all the requirements necessary for self catering if required as the kitchenette has fridge; vitro ceramic hob; microwave and ample crockery and cutlery. Perfect for a couple, two couples of friends, or small family who want independence and privacy with your very own holiday cottage in the country.. 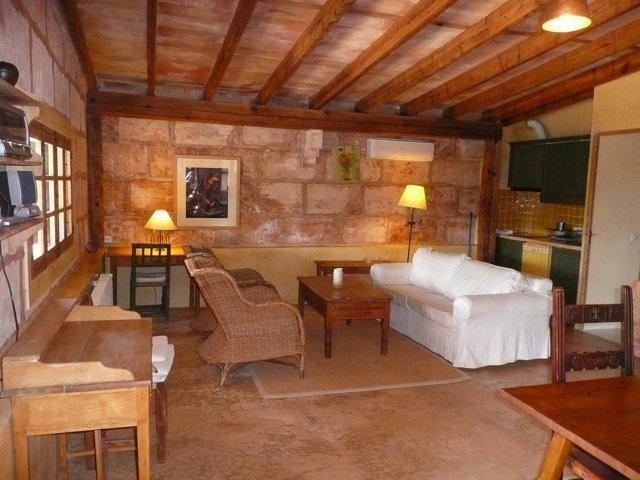 The cottage is very spacious measuring 100m2. It has just one very large bedroom, but with a lounge – dining room that has sufficient space to create another sleeping area. Here we have a quality large sofa bed, or individual beds can be assembled. 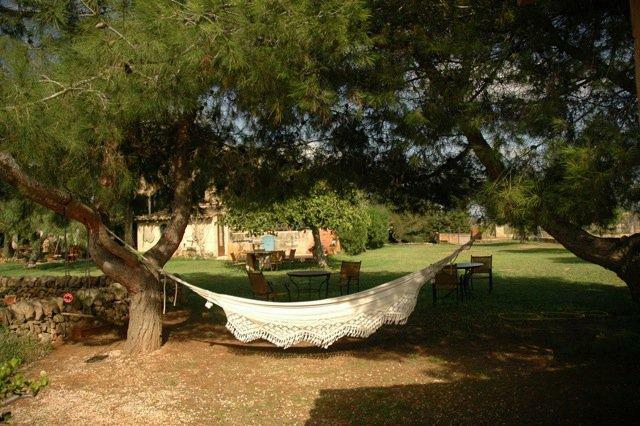 Ideal for two couples who wish to share a holiday atmosphere in a comfortable atmosphere. 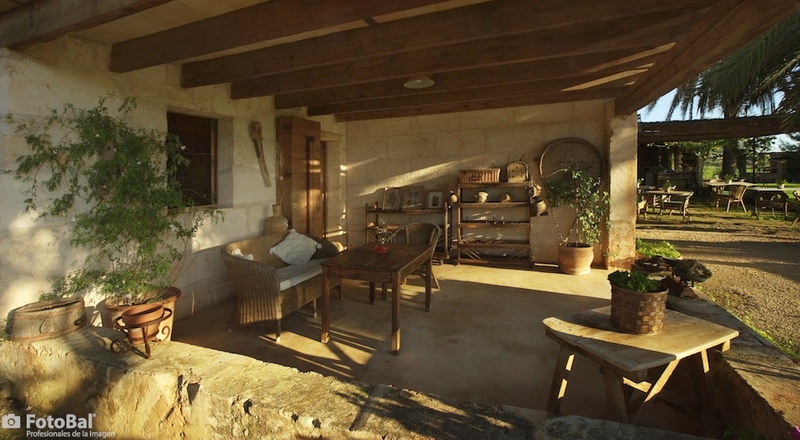 The porch in front of the main garden has the additional pleasure of the most beautiful sunsets – combined with a barbeque and a bottle of wine – how much better can a holiday be? 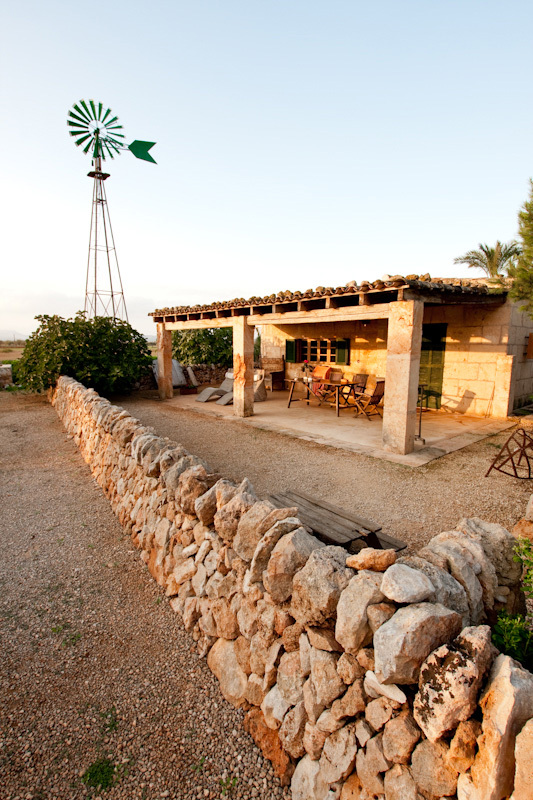 Thanks to the loyalty of our clients, we have now added 2 extra rooms (Fauna and Flora), so we can provide additional accommodation for the growing demand for our little oasis here at Sant Blai. Here we introduce Flora our newest cottage. 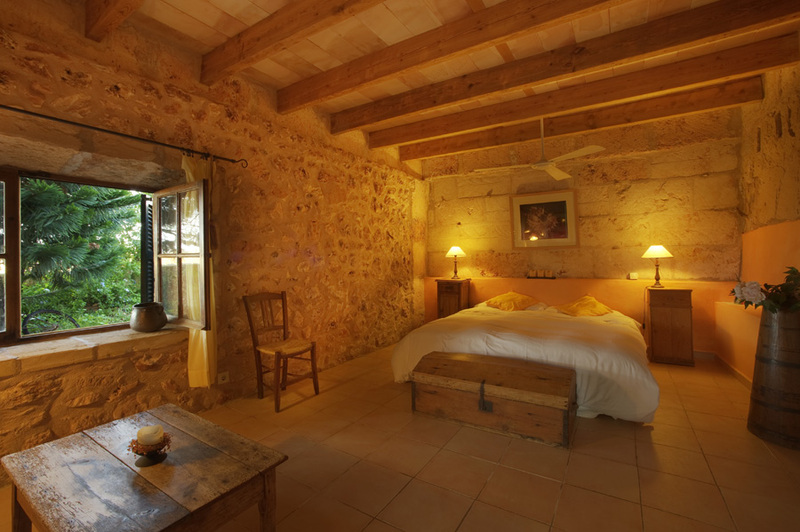 It's name follows the theme of the decoration you will find when you arrive and the flower filled private garden – complementing the adjoining double room "Fauna" and the other cottages dedicated to the four elements. Flora is a very spacious and bright cottage with a private porch and garden, facing the main garden and a short walk to the pony and donkies. 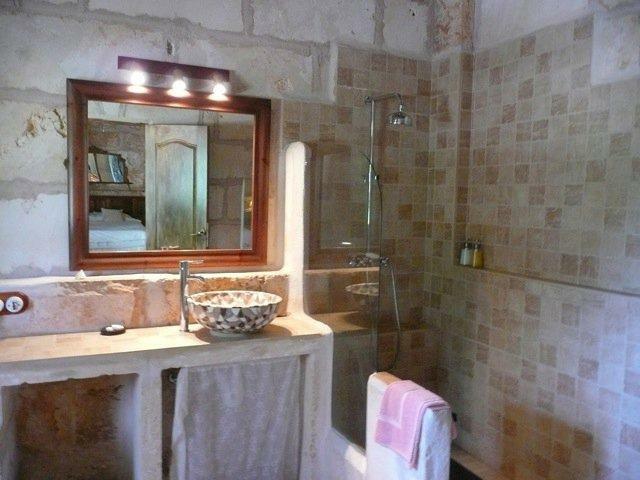 A big room with a bedroom and lounge Open Plan, a small compact country kitchen and bathroom with a very special double sized shower. 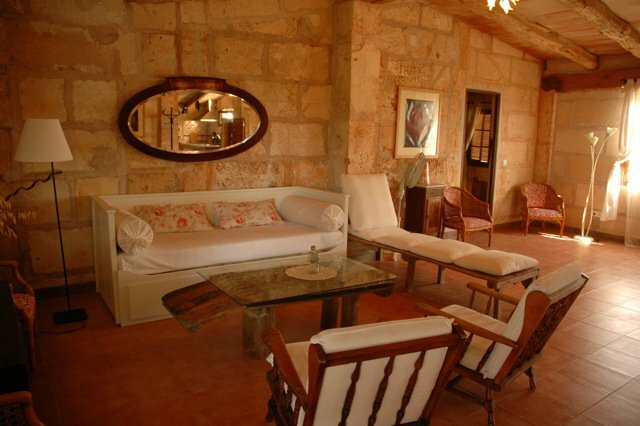 Flora is our biggest cottage, and it's living room is more than 63 m2!!! About 130 m2 in total! 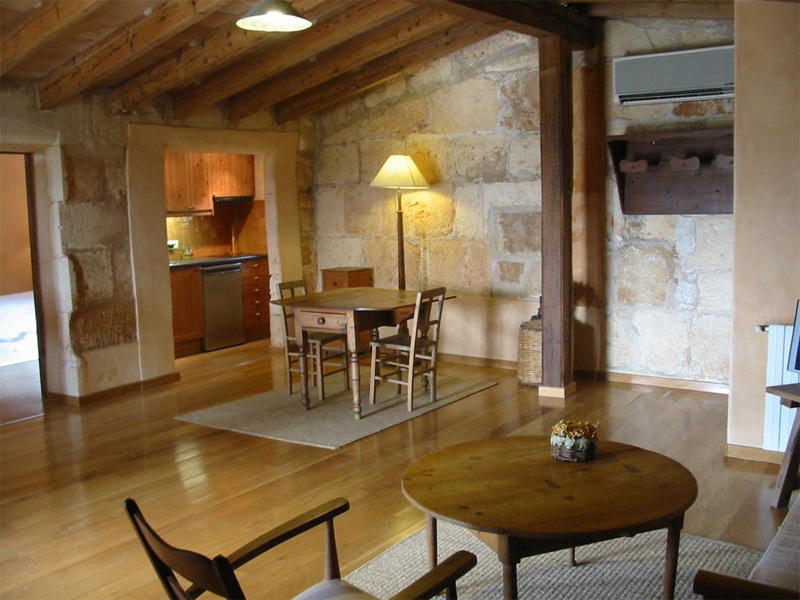 Maintaining our current style at Sant Blai, with exposed wooden beams, rustic floors, walls of local marés stone and much more. Flora will exude a natural decoration to personify it's name and impact you with the colours and aromas of an abundant country garden. 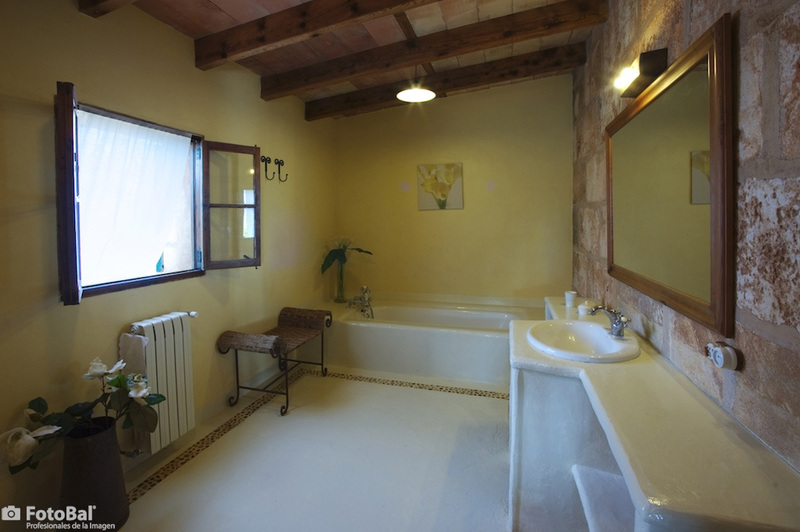 Comfortable, spacious accommodation – full of life, providing natural surroundings to escape from the city or a perfect love nest for that romantic break Ideal for a couple, or up to 6 persons. Again it has one bedroom but with more than 60 m2 of living room, even if you are a bigger group you will be really comfortable. Fauna, our newest double en suite room is alongside Flora, but at the same time if required they are both independent and each one has it's own porch-terrace. 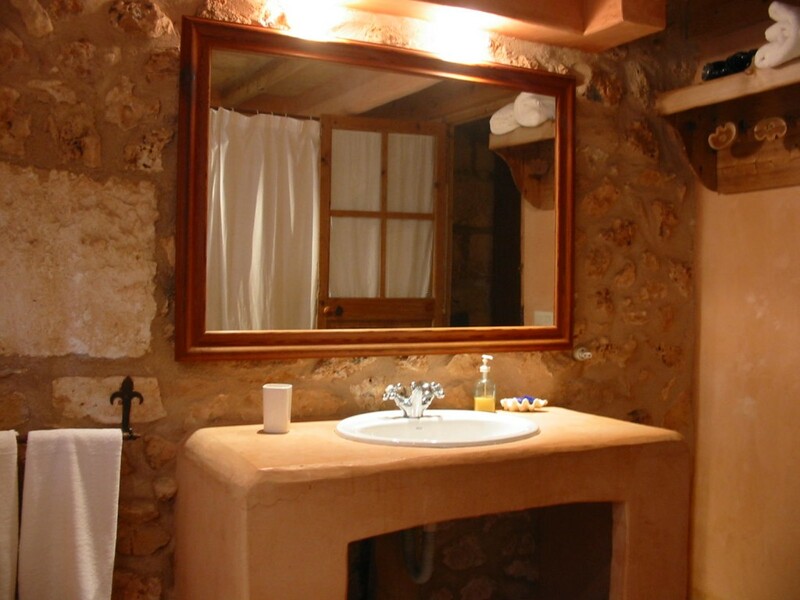 Tierra is decorated with earth colours combined with the exposed stone walls and wooden beams throughout, and is a little larger than "Fuego". Tierra does not have a private garden, but is situated in front of the lawns of the main garden and has it's own covered porch area. To the front their are views of the main garden and to the rear views of the private garden of "Fuego". You can see the green vegetation from all the windows of the room. 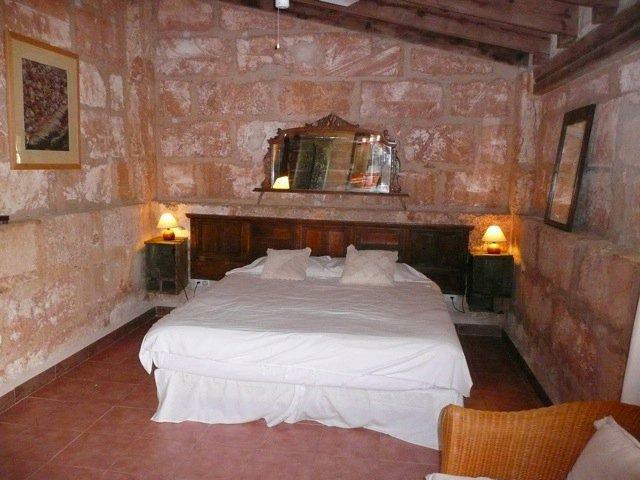 This room has a lot of character and is very spacious for two people. Tierra does not have television or refrigerator or cooking food storage facilities ( food is not permitted in the double en suite rooms). However remember that the communal living room is always available with the Tv/DVD/Music system facilities that you are very welcome to use. 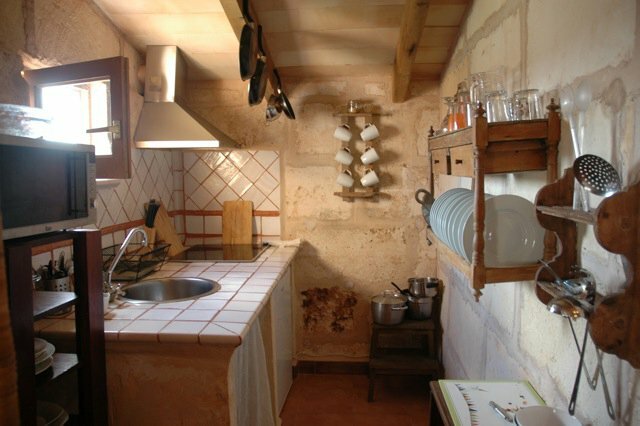 There is no kitchen within the double rooms, but this room is situated closest to the communal summer kitchen/bar and the communal lounge area and porch. Fuego takes it's name from the warm colours in it's decoration – reflecting the beautiful sunsets we see every day here. The principal characteristic of this room is it's own private garden. Numerous assorted flowers giving a wonderful aroma to be enjoyed with an afternoon barbecue or just a bottle of wine in the warm evening air. With it's own seating area surrounded by candles suspended in the trees at night or under the shade of the mature trees during the day – the garden has been completely reformed and landscaped to create a perfect area to relax. 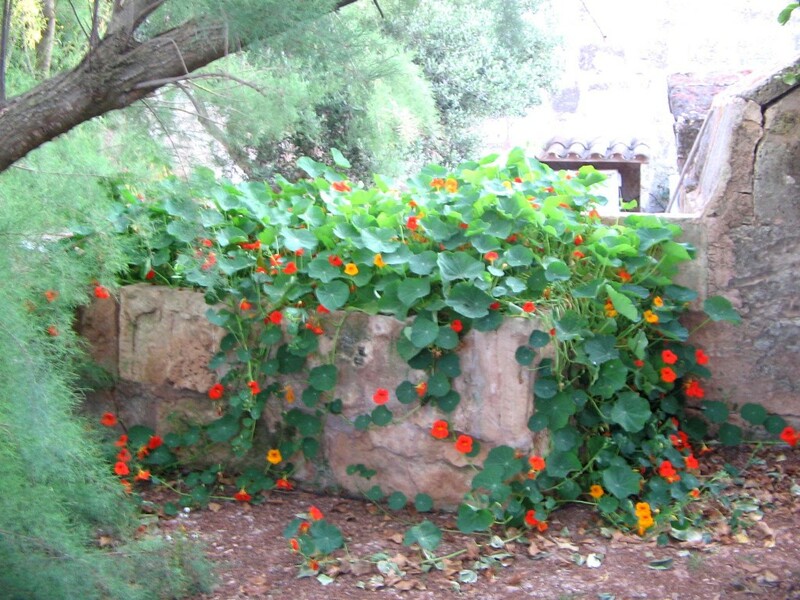 One of the original characteristics of the garden is the original rabbit house, constructed in mares stone, now fully restored where you will find Bunny & Clyde – Sant Blai's fluffy rabbits – waiting to get to know you.. They too have a spacious suite! Fuego does not have TV or refrigerator or cooking/ food storage facilities in the room (food is not permitted in the double en suite rooms). However remember that there is a large communal garden kitchen for use of the double rooms with a large communal living room available with the TV/DVD/Music system facilities that you are very welcome to use. It's a magical place – you will see! A spacious bedroom with a surprising bathroom complemented with a beautiful private porch, adjacent to Flora cottage and facing the main garden. 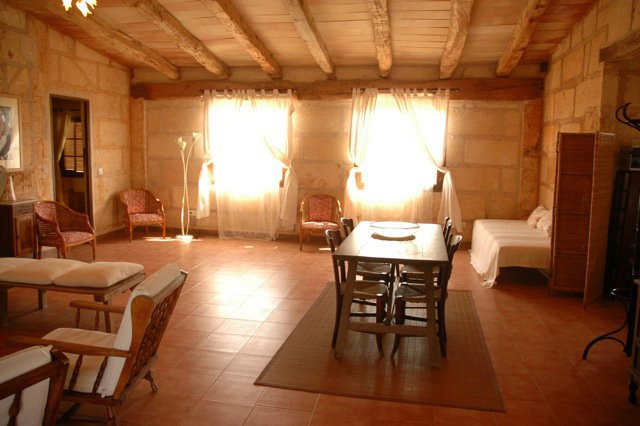 Spacious double bedroom with full en-suite bathroom. 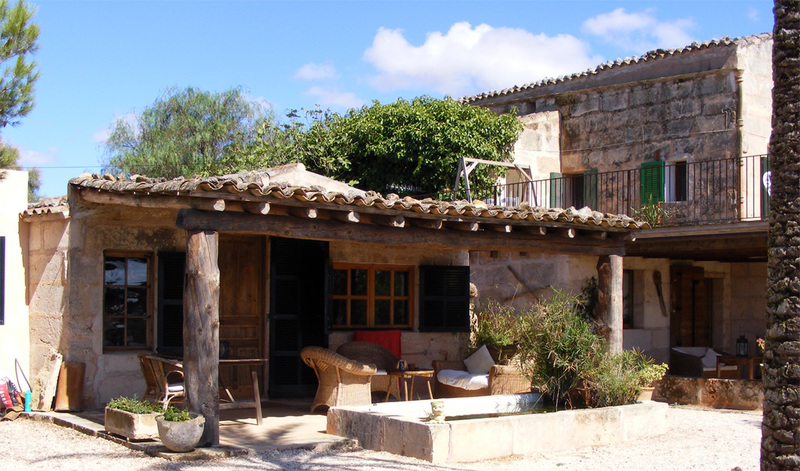 The design is very exclusive, but always maintaining the rustic theme found throughout Sant Blai – wooden beams, natural stone walls and the natural country surroundings. Remember that with Fauna you can also add the cottage FLORA next to it – ideal for families or friends holidaying together. Fauna does not have TV or refrigerator, cooking /food storage facilities (food is not permitted in the double en suite rooms). However remember that the large communal garden kitchen is available for use by all the double rooms and the large communal living room is always available with the TV/DVD/Music system facilities that you are very welcome to use. Awesome new 4 meter trampoline!